Twelve years ago to the week, when Ho’olohe Hou Radio was in the third week of its first incarnation as a podcast, the show quickly gained acclaimed among musicians in Hawai’i for a two-part, four-hour episode on the legendary Pua Almeida. You see… Hawaiian musicians owe a debt to Pua for revolutionizing Hawaiian music, and yet few who don’t own an old-fashioned record player have ever heard his music. For while he was one of the most prolific recording artists ever, only about a half-dozen of the sides Pua Almeida cut have yet seen the light of day on a CD or MP3. Flash forward a dozen years… While I should have been continuing work on the fifth reboot of Ho`olohe Hou Radio since its inception as a podcast on January 1, 2007, instead I spent much of this month perusing the reboot of the seminal book on Hawaiian music. Originally published in 1979, Dr. George Kanahele’s “Hawaiian Music and Musicians” has been the bible for fans and students of Hawaiian music for over 30 years. Oddly this veritable encyclopedia of the history of Hawaiian music did not contain an entry on Pua Almeida except as a footnote to the entry on his hānai father, legendary composer and entertainer John Kameaaloha Almeida. It is criminal, then, that the 2012 version of the book – updated by music reviewer and local Honolulu entertainment columnist John Berger – still does not contain an entry on Pua Almeida. Just as the podcast aimed to do 12 years ago, Ho`olohe Hou Radio dedicates the entire month of February – in commemoration of both his birthday and his untimely passing – to preserving the memory and the unique sound of Pua Almeida and his many rare talents. This means I have a lot of work ahead of me. Pua was not the first Hawaiian music I heard as a child. I did not discover him until my impressionable teen years. But what an impression he left on me. Pua’s approach to Hawaiian music was like no other – a combination of traditional Hawaiian, jazz, Latin, dance hall, country, and – frankly – whatever the hell else fancied him or the amazing musician friends with whom he surrounded himself who assisted in crafting his unique sound. So Pua and his group became the template for my own approach to Hawaiian music. From the first moment I heard him, I have spent my lifetime since amassing as much Pua Almeida material as I could lay my hands on – including ridiculous bids some years ago now on an eBay auction of items from Pua’s estate. In fact, I have made discoveries of unreleased Pua Almeida music as recently as a few weeks ago in a private collection that has been shared with me. So with this wealth of material to draw upon, where does one begin? All month long Ho`olohe Hou Radio will attempt to cover Pua’s many accomplishments chronologically – educating the listener about those points along this journey where Pua and his fellas wove together past and present to create an unpredictable future and why these inventions were historically important. (For example, if you are a fan of Roland Cazimero’s guitar stylings, thank Pua Almeida whom Roland counts among his chief influences on the guitar. Do you enjoy the steel guitar of Jeff Au Hoy? Jeff found his lifelong passion for Hawaiian music listening to Pua Almeida records which often featured the steel guitar of Pua’s sidekick of many years, Billy Hew Len.) 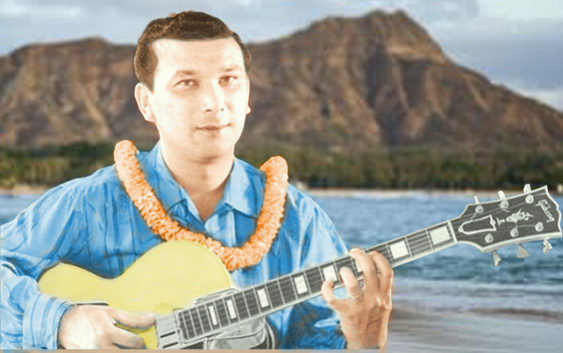 Pua recorded hundreds of sides across more than a dozen labels – not only as the featured artist, but also as a much in demand sideman for both his amazing rhythm guitar work and his unique steel guitar stylings, work that often went uncredited (a wrong finally righted by the keen musical ears of Ho`olohe Hou Radio’s creator/host). Over the course of the month of February you will hear and learn about every aspect of Pua’s amazing abilities – from his jazzy rhythm guitar playing to his unique approach to the steel guitar to his legendary voice. And there is a wealth of material to choose from despite his recording career having been cut short by heart problems shortly before his 52nd birthday. One of the most charismatic figures in the history of Hawaiian music, Pua Almeida is too good for a place in an encyclopedia. He deserves a place in the hearts of all Hawaiian music lovers the world over. And my goal this month is to ensure that happens – once and for all. P.S. Stay tuned to this site for information about a very exciting new release from Ho`olohe Hou Records which just might feature Pua Almeida – including more than three-dozen previously unreleased songs.